This page was inspired by several of my students -- who suggested I dedicate a space on my web site to 'TELLING IT LIKE IT IS' -- so here it is, by what appears to be popular demand! Many of you have asked me questions in past classes about diving equipment, and about specific classes. On another note, many of you have had "less than pleasant" experiences with a dive shop where I used to send all my students for their rentals and equipment purchases. Unfortunately, you were not the only ones who had "less than pleasant" experiences with that facility, which I shall be professional enough to not name here. I, too, was lied to, and treated like I was just taking up the owner's time. Initially, the owner of that facility talked the talk. But as time passed, it became very apparent to me (and to many of you) that he ultimately did not walk the walk. It honestly got to the point where I dreaded even having to go there and deal with that individual. Q: I'm going to purchase my mask, snorkel, fins, and boots for your class. What can you tell me that will help me select the right ones? A: Mask, Snorkel, Fins & Boots - The MOST important consideration is FIT.....FIT.....and FIT. I have said many times over the years that people should be blind when selecting these items, because they get too hung up on color and that ultimately influences their decision more than the fit. It should not! Your mask is your window to the underwater world. If it leaks, due to improper fit, you are going to be miserable every minute. So only AFTER you have determined which mask fits you best -- can you then explore different color options with THAT SAME MODEL that fits you the best! Fit must be the # 1 consideration. If someone tells you their most expensive mask is the best one for you - and you haven't even tried on a single mask -- turn around and leave immediately! That is a guaranteed sign that they only care about their sales and don't give a damn about your needs! If the most expensive mask on the wall doesn't fit you, it isn't worth a dime to you! After trying on several to determine which one gives you the best seal, then you can think about color options. Cost cannot be a consideration when selecting what is best for YOU when it comes to these fit-specific items. As for fins, I have been using Cressi Space Frogs for years. I prefer a stiffer blade. You can choose between a stiffer blade or a more flexible one - that is personal preference, but again, those choices should always come AFTER fit. Unfortunately, the model of fins I have been using for 12 years is no longer being manufactured, so I have not decided what I am going to do once these wear out! They have at least 5 or 6 more years to go, so I have some time to work on this one! Q: Which brands of BCs do you recommend? A: With this kind of equipment, you have to ask yourself how much diving you think you will be doing, and what kinds of diving. If you plan to take several different specialty courses, which may include technical diving, then I would suggest investing in a BC that will hold up to all kinds of diving. It may cost more, but it will keep you safe and happy. On the other hand, if you are only planning to dive a few times each year, a simpler BC with few or no "bells and whistles" will likely meet your needs just fine. I need to also say that when I recommend a specific brand of equipment, it is one that I have personally been very happy with for a long period of time. It is one that meets my needs as a diver regardless of what kind of diving I am doing. And it is one that is backed up by its manufacturer! That being said, I will say that the DIVE RITE TRANSPAC is my all time favorite BC, and I have tried and used many brands over the years, so this is a very objective statement with a lot of perspective. 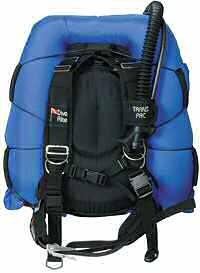 I've been diving a DIVE RITE TRANSPAC with CLASSIC WINGS for the last 15 years and am not likely to ever change to anything else. A close second would be an OMS (Ocean Management Systems) or HOLLIS BC. They are very similar to the DIVE RITE TRANSPAC. And SEAQUEST and AQUALUNG are two more good ones. One of the brands no longer being manufactured that were on of my favorites in the 80s was SEATEC. Remember that this is LIFE SUPPORT EQUIPMENT we are talking about -- and your REGULATOR and BC are the most critical parts of your system! At this point I need to remind those who read this that I am not tied to any one dive shop, which means I do not work for a dive shop and am, therefore, not forced to promote the lines and brands of any shop. Been there, done that, got the t-shirt. If a product is good, I will tell you so. When you work for a shop, the owner or management wants you to push every single line they carry as being great ones. But here in the real world, that, in my opinion, is doing a disservice to the customer, because there are great products out there -- and there are some not-so-great products out there. Let me emphasize again that these are my opinions based on my experiences -- with a few considerations for my students' experiences thrown in as well. You can find other brands of gear out there that are great. I'm just not going to rave on them here if I have not had personal experience with them. Q: What about regulators? Which do you recommend? A: My favorite is APEKS. They're made in England. The ATX and XTX models are all great. I personally dive the ATX 100 most of the time, but also own the ATX 50 and the ATX 200. My favorite brand from the 80s and 90s is SHERWOOD -- The Magnum II and the Magnum Blizzard are both GREAT! I would stay away from the BRUT and the OASIS models, however. U.S. Divers also made great regs. I own a couple of those as well. Aeris is another good one. A close friend of mine who has also been a NAUI instructor for many years --- is partial to Cressi regulators, and based on my trust of his opinion, I will recommend this brand as well. I have not personally used Dive Rite regulators, but if the quality of their regs is anything like their BCs and canister lights, then I would also recommend these. Q: Should I get a wetsuit or dry suit? A: First of all, my answer is applicable to where we are, which is the Pacific Northwest. I know a few divers who have good-fitting wetsuits and will likely never switch to a dry suit. I think the biggest difference in the two is the difference when you are not diving! Putting on a cold, wet wetsuit is not the best thing in the world to experience, nor is taking off a wetsuit on a cold, rainy day! A dry suit will certainly cost you more, but in the long run I think divers who have made the switch from wet to dry are happy they did so. If you are going to dive dry, then you have two options: neoprene or nylon shell dry suit. Some divers swear by neoprene dry suits. Personally, I prefer a nylon shell dry suit. To me, a neoprene dry suit is more restrictive and more buoyant, which requires you to carry more weight. As for which brands, if you are going with a wetsuit, there are several decent options. Among these would be Harvey's, Henderson, and Bare. As for dry suits, I am inspired by a quote from Highlander: "There can be only one!" And that one, with my 40+ years of experience as a diver --- is O.S. Systems! I have personally been diving with an O.S. dry suit since 1984. 1. I stay dry when I dive!!! 2. The company stands behind its product! Isn't is comforting to know you are dealing with a company that backs up what they make and sell? Not every company does. 3. O.S. Systems is a local company, in Scappoose, Oregon. This means that should you need any modifications or repairs to your O.S. dry suit, they are close, and therefore, you will wait much less time to get your suit back! 4. Pricing! There are many brands of dry suits out there, and many of them cost a lot more than an O.S. dry suit, but none of them come close to the quality of an O.S. dry suit! I have had so much faith in O.S. Systems and their product for so many years, that I am now a dealer for O.S. Systems. So when you decide it is time for a dry suit, or when you are ready to replace your old dry suit, I will be glad to get you into an O.S. dry suit. And I will save you a substantial amount on what you will pay for it, too! I will beat any other price you can find for an O.S. dry suit package! And it will be one of the best investments you will ever make as far as your diving equipment is concerned! With its built-on Polar Boots and Dry Glove System, even your hands and feet stay dry! If you suspect I'm sold on O.S. Systems, you would be 100% correct! And that's the opinion of a person with 40 years of diving experience, 30 of which have been spent teaching diving classes. I've used other brands of dry suits in the past, including Bare, Poseidon, Viking, and DUI...all GOOD SUITS!!! I feel with my O.S. suit, I am diving the BEST! And again, that is just my personal opinion. For the bulk of what is out there, is often comes down to what I might compare to a Ford or Chevy thing. And perhaps an extension of that is to feel like "Hey, if I am happy with this -- if it is reliable and durable -- if it meets my needs -- if it is safe -- and if the company stands behind it --- WHY USE ANYTHING ELSE???" If you decide you want to go the neoprene dry suit route, then I would suggest a BARE suit. If you already have a dry suit that meets all your needs -- by all means keep diving it. As I said, why change what works great for you??? These are just my opinions -- based on my personal experiences -- or those of my friends, fellow divers, and students. Q: What do you recommend in the way of dive computers? A: I prefer an air-integrated system as opposed to a dive computer worn on the wrist, and I personally like the dive computers made by AERIS. I've been diving an Aeris 500AI since 1999, and I'm very happy with it. It's a model no longer being sold or serviced, so I know that eventually I will have to switch to a different computer, and when I do, it will be an Aeris Atmos AI. But my 500AI is holding up just fine! Why switch until I absolutely have to? The COBRA is another one I would personally recommend. In fairness -- there are other dive computers out there that are good. But as I have not tried them personally, I cannot say which ones. Again, Pacific Watersports in Aloha, Oregon will not steer you wrong! Q: How about dive lights? Which do you recommend? A: Any lights made by UNDERWATER KINETICS! 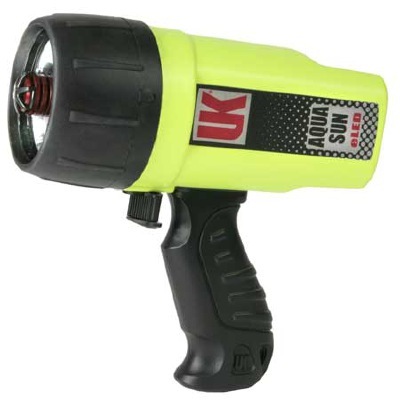 But the best of those are the AquaSun eLED and the Light Cannon 100 HID. And my favorite canister dive light (that is, where the battery is contained in a canister that is either mounted to your tank or worn on a belt) - would be those made by DIVE RITE. Another thing you can do is to look at the gear your instructor is wearing. If he or she has been an instructor for at least 5 or 6 years, chances are they are using some of the best dive gear there is. Admittedly, and as I have already stated --- the preferences among the best are often a "Ford or Chevy" thing, but I cannot stress enough that this if life support equipment, which is one of the key factors in your safety as a diver. What are the others? Experience, training, knowledge, good judgment, and confidence! I have always been and will always be a stickler for SAFETY. And I will only recommend specific brands or models of gear that I am 100% certain will keep you SAFE as far as equipment is concerned! And if it happens that you are using any of the brands and models that I do not personally recommend, please do not take offense. As I said, I am basing my preferences on what has worked well for me, what has not worked well for me, and the experiences of other divers ranging from beginning divers to instructors. If you have already been using something that works for you and that you are happy with, keep using it, by all means! Q: Which dive shops do you recommend? A: First, let me tell you the KIND of dive shop I recommend. And then I will tell you the KIND of dive shop I do NOT recommend. I will always recommend the KIND of dive shop that I hear lots of positive things about -- that my students have positive experiences with -- and that I personally have positive experiences with. 1) You never get a second chance to make a first impression. 2) If you don't take care of your customers, your competition will. Believe it or not, there are businesses out there who could care less if they keep you as a customer. I am sure you have encountered at least one of those in your life, yes? The business world has a few of those in every field. Retail dive shops are but one of them. I recommend the kinds of dive shops who make an effort to keep you as a customer, and don't make you feel like you are just taking up their time. I recommend the kinds of dive shops who care more about your needs as a customer than they do about making a bigger sale or more profit. And I recommend the kinds of dive shops that are consistent with their good treatment of customers. I will not recommend a dive shop to my students or anyone, whose owner or staff have lied to me or my students. One of the biggest lies told to one of my students in recent months was that "steel tanks are no longer being made" and that "everyone is going to aluminum tanks." And it was the OWNER of a dive shop that told those lies! Laurie at Pacific Watersports said if she ever heard that one of her employees had told such a lie to a customer, they would be fired on the spot. That same owner of this "un-named shop" told me on two different occasions that specific dive equipment manufacturers were going out of business or defunct. He told me "he had heard" that Dive Rite was going out of business and that it was no longer possible to get parts for Sherwood regulators. What a coincidence that he is not a dealer for either one! So rather than tell you up front that he does not carry these lines, and perhaps suggest some alternatives that he does carry, he would rather lie and have you believe that the ones you are interested in are no longer viable options. How sleazy and unethical is that? When I shared this, too, with Laurie, at Pacific Watersports, she said "Why is he doing this? People are not stupid. If they don't already know something, they usually research it. The economy is bad enough, and you certainly don't need to do things that intentionally lose you more business!" Lie to a diving student and lose a dozen or so customers over time. Lie to an instructor and lose hundreds. It should come as no surprise that this individual does not stock steel tanks and simply wanted to make another sale on an aluminum tank. When I was told about this, I decided then and there that I would never again send anyone to that facility. For equipment purchases, I highly recommend PACIFIC WATERSPORTS in Aloha, near Hillsboro. Laurie, who owns and manages the shop, is a gem in the world of diving retailers! You will never regret dealing with Pacific Watersports. And I can say that without any reservation whatsoever. I will never have to wonder if a student I send there is going to come back with a horror story! Another facility I will recommend is SCUBA SET in Federal Way, Washington. I have known Walt Amidon, the owner, for over 30 years -- back when he worked at NAUI Headquarters in Montclair, California. Walt will never steer you wrong! Q: Any other reasons you would not recommend a shop? A: Yes. I have a problem with shops that do not pay their instructors for classes that have been taught and completed three, four, or five months previously. There are a couple of those in Washington state who have had that reputation for many years. I used to manage one of his shops, and it was shortly after 9/11 that I told him he needed to start paying his instructors on a more timely basis because it had been affecting the morale in his stores for far too long. His reply to that was "If I hear you say that one more time, you won't have a job anymore." Fortunately, those kinds of shops are very rare. Q: You teach a very wide variety of courses, but I notice that you do not teach Nitrox or Trimix. Why is that? A: Good question! To be honest, advanced mathematics -- things like algebra and formulas -- are things I do not enjoy. I never have. That's just me. So if I was teaching a class that involved a great many things I did not like or enjoy, I think that would reflect in the quality of my teaching. That is why I do not teach Nitrox or Trimix. I prefer to teach the courses that I love to teach -- that I am very passionate about -- and that, too, I believe, is reflected in the quality of my teaching. But if you are interested in those kinds of courses, I will be more than happy to put you in contact with NAUI instructors who are very good at teaching those! Q: How do you feel about rebreathers? A: I will tell you that there are people out there who think they are the greatest thing since sliced bread. And I will tell you why I would never dive with one, or recommend that anyone go that route. They have not been around long enough to have worked all the bugs out of them, and if you are diving with a rebreather, by the time something fails in the system, you are usually dead. There are far more fatalities in the world by divers using rebreathers than there are by those on SCUBA. Some very experienced, educated, and skilled divers have died from using rebreathers in the short time that they have been around -- the two most recent being Andy LeTourneau and Wes Skiles. So that is how I personally feel about rebreathers. Like I said, there are divers who will disagree with this and tell you they are the best way to dive. The thing is, is you are using one and it fails, you can't be any deader than dead. I'll stick with SCUBA. I can easily monitor my air supply, my depth, and my bottom time. There are no hidden surprises with SCUBA, or things that can go wrong and kill you before you even know something is amiss! And hey -- I feel that is simply telling it like it is. These are my opinions -- based on 40 years as a diver -- and 30 of those teaching diving classes. I have recommended specific items here that I am very pleased with -- equipment that has proven itself to me time and time again. And again, this is LIFE SUPPORT EQUIPMENT. I want to know that what I am using is reliable, dependable, and sturdy -- something that is going to last me a considerable amount of time. I always used to say" "Diving is the greatest -- but what you spend on it doesn't have to be." But the other side of that coin is that "Cheapest is not always best!" -- and I would say you need to keep this in mind when selecting your BC, dry suit, regulator, and dive computer. I cannot stress enough that this is life support equipment! "Beware of discounts on diving equipment and brain surgery." You have to weigh the two against one another and arrive at decisions that are SAFE and will work best for you!